From their introduction of the world’s first interpoint production Braille embosser in 1980, Braillo has been determined to manufacture the finest Braille embossers capable of embossing high quality Braille, both quickly and reliably, over long durations. Braillo has achieved this goal through a combination of dedicated engineering and precision components. Production Braille embossing requires the level of engineering found only in a Braillo. The shape of a Braille dot is the first criteria for giving the reader a predictable tactile experience, as well as making the dots legible to a blind reader. Dots with different shapes may cause the reader to stop and re-read them, so Braillo shapes the dots by locking and evenly distributing the pressure of specialized steel pins into heavy duty printing shoes. This dedicated movement allows Braillo to create uniform dots that are perfectly round, clear and easily recognized – every time. On the next embossing cycle, these print shoes hold the previously embossed dots firmly in place so they do not deform, bend or lose their height. Making sure the dots keep their round shape is paramount for a Braille reader to understand what it is that they are reading. To meet these rigorous standards during a full day of Braille production, Braillo uses a mechanical embossing principle that employs magnets with a simple function – to engage a lever of its embossing system when it’s time for the dot to be embossed. Every Braillo is built with up to 180 such systems, and they are engineered so the magnets are completely isolated from the physical shock of the embossing process. The result is consistent height and unparalleled reliability. Perhaps the most important aspect of Braille quality that is often overlooked is dot placement. For the reader to understand what each dot represents, the dot needs to rigidly conform to a precise alignment of columns and rows. 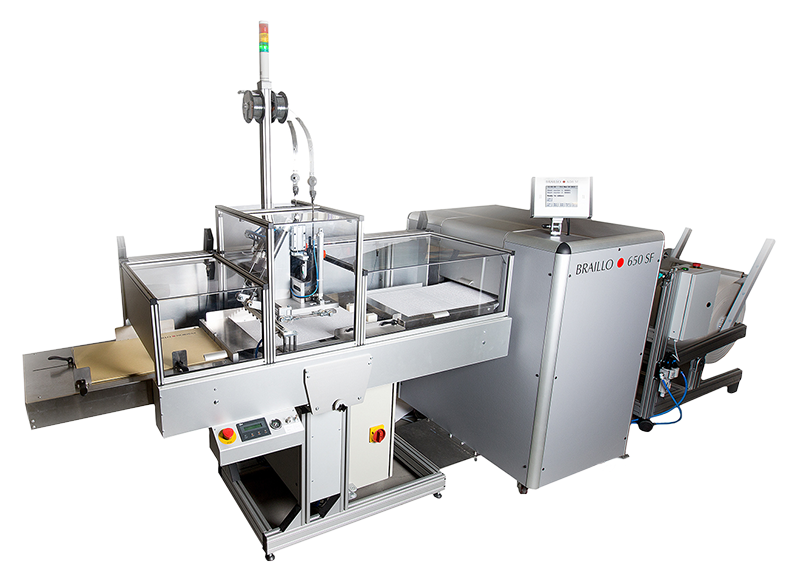 As stated, Braillo production embossers use up to 180 individual embossing systems which are fixed, so they can emboss an entire line of Braille in one cycle. These fixed systems ensure that the Braille dots are precisely aligned in the correct Braille locations – every time. When considering the purchase of a production Braille embosser, your return on investment is highly dependent upon embossing speed, embosser lifespan and the quality of your finished product. Therefore, we strongly encourage you to evaluate not just price, but what is behind the price. For over 30 years, Braillo has refined the art of producing consistent, high quality Braille to provide the best possible reading experience for your customers. We start with the highest quality parts, components and machinery. Braillo Braille embossers are engineered to consistently produce the best Braille dots at the highest speeds, all with minimal maintenance. This combination of engineering, quality, reliability and decades of references, is the reason why Braillo is recognized as the most trusted production Braille embosser. Braillo embossers are the only embossers that are thoroughly engineered to withstand the requirements of true Braille production. Other manufacturers produce embossers that are designed for personal Braille use and attempting to use this type of personal printer in a Braille production environment will result in poor Braille quality and probable embosser failure – both of which cost time and money. Your embossed paper can be stapled or formed into a complete book!